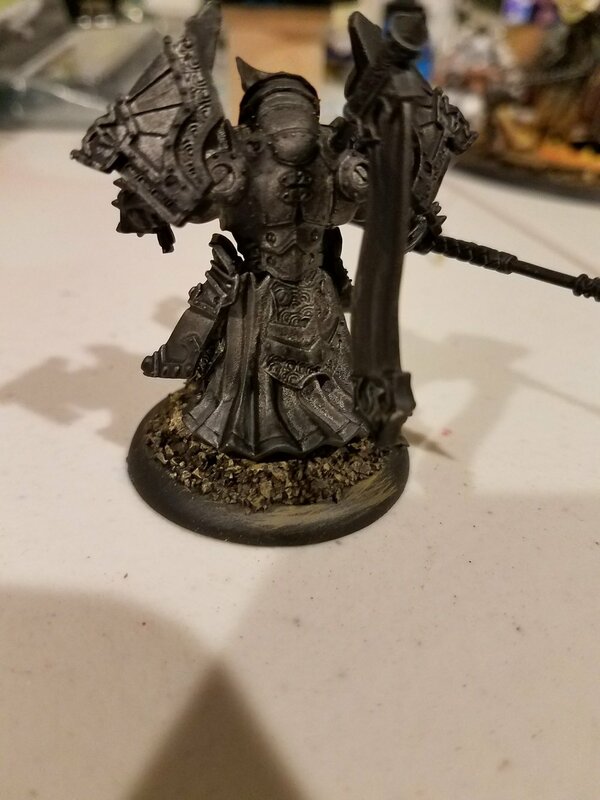 I started off my Menoth army with two goals - put freehand on every model I paint AND make some awesome looking bases. Fortunately, my roommate is a firm believer in making the bases ahead of the model, a concept which was alien to me until recently, and so he forced/coerced/shamed me into making myself some good looking bases. If all you want to do is see how to do the fire, scroll down to step 3 and 4 - steps 1 and 2 are all about making the base initially. Basing Material - this tutorial uses two different grades of sand mixed together, as well as some bigger gravel bits. All of this is based around 1/4 inch cork board. A Sculpting Tool with a flat and pointy end. Super Glue and White Glue. Start things off by super gluing some cork board to your base. This should have some cracks between it for interest. After that, you drench the base in White Glue, filling in the cracks and all of the exposed top surface not covered by cork board. Place a couple of bigger rock bits where they look good and then dunk it in your sand mixture. Once that's dry, prime that sucker! I've typically done these in batches of 5-10 for the various units. These were done up for Bastions and a Bastion Seneschal. It's not worth the time to get out all the material for one base if you know you are gonna need a bunch later. Not really, but it is painting time! This step requires your dry brush. Mine is...well it's a poor old thing. Oh and some paints too. You're going to want to get some Tierra Earth on that brush, and wipe the excess off on a paper towel before drybrushing a thick layer onto the base. Next up, DO NOT WASH YOUR BRUSH! This will require you to wait a long time for it to dry out well enough to dry brush with again. Instead, wipe as much of the Tierra Earth off as you can, and then get some Rucksack Tan on there. You are going to want less of it than you had of the Earth, and apply it over about 70% of the base, keeping to the edges and tops of the sand mostly. 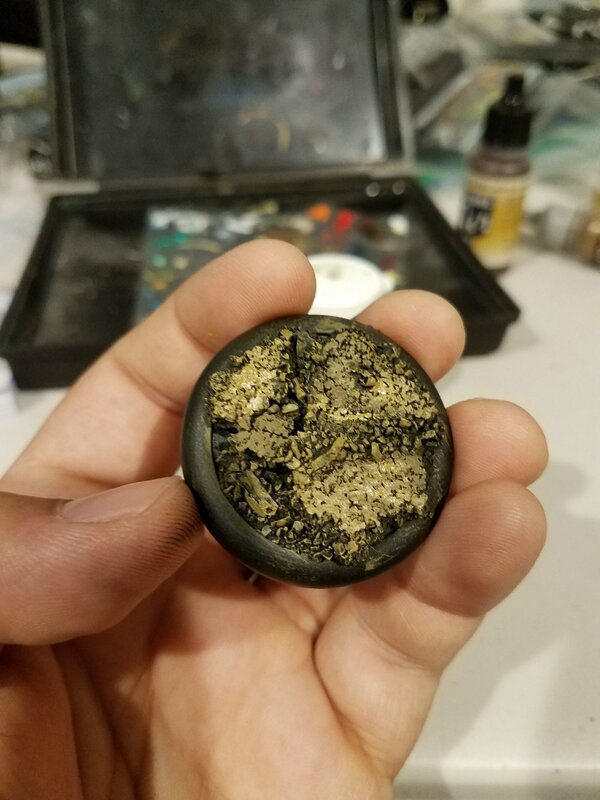 Again, do NOT wash your brush, wipe the Tan off and apply a very small amount of Jack Bone to your dry brush and add it on about 20% of the base, hitting the high points of the rocks and the edges. This final bit here is optional, but I think worth the extra effort. Using a very thin glaze (watered down paint, but not a wash), push some of the Armour Brown into the edges where the Cork meets the Sand. It breaks up the base and gives some definition to the segments - contrast is everything in miniature painting. You're going to need your sculpting tool and some of this stuff here. I've gone ahead and made a video of myself sculpting some fire onto the models base. A couple of things I didn't mention though. 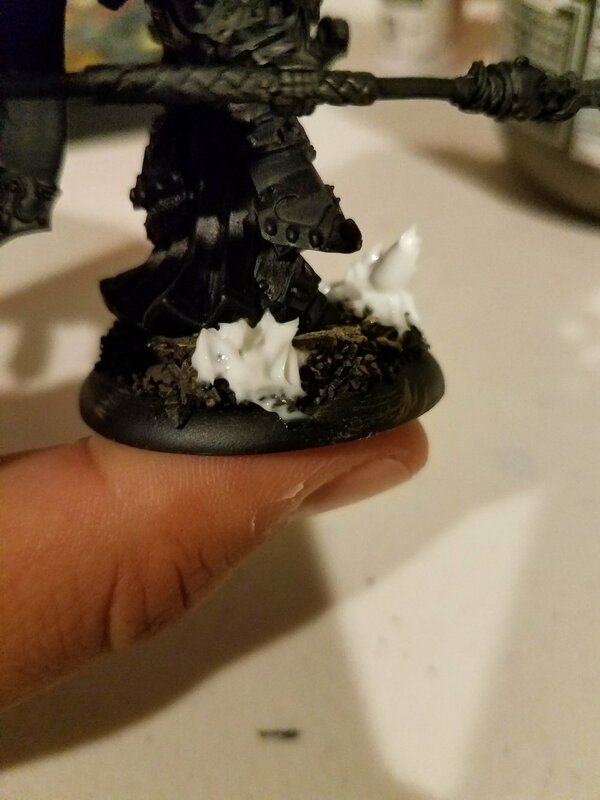 First, get that model primed and attached to the base - this will let you know where you can safely put the fire effect without making the base inhospitable to the model. Second, I recommend putting the model on a holder like I'm using in the video here. What is that you say? Well it's a wooden spool for thread that I got at a craft store. I put some blue-tac on top of it, and just by smushing the base down into that blue-tac, you get a nice firm hold. For those of you reading this at work or unable to view video on their device, I'll go over a quick summary. Glomp some of the gel on an exposed area of the base. Sculpt little points on it with your finer tip on the sculpting tool. It's best to use a gentle flicking motion here, as the gel does not require much pressure to handle. Finally, let it dry for at least a day. It'll turn transparent when it's done. Here's a picture of the final product from the video. Since it takes a full day to dry, I swapped over to one of my unpainted Vengers to do the last couple bits here. I like to do the fire before the model so that if I want to do Object Source Lighting on the model, I don't have to worry about what the flames look like. The White mixed in with the yellow makes it cover a lot better. Cygnus Yellow is an intense color, but it's very thin so getting it down is difficult. This is going to go at the top of the "flames", and it will cover say 30% of the area. Don't worry if it doesn't blend in super well, that's what the next step is for. This only requires 1-2 coats. Time to bring it all together, layer Cygnus Yellow over the majority of the fire. Each layer will blur the edge between the Orange and the Yellow until it's a fairly smooth transition. This took me approx. 4 coats. For the very tips of the fire, mix some Khador Red Base and Armour Brown about 1:1 and thin it down a little bit. Just hit the tips of the fire to really make it look correct. There you have it guys! This method is a great one for assembly line creating bases, as the colors go on so fast for each thing it almost doesn't feel like it's worth it unless you're doing four or five. I've really enjoyed the way they look on the table together, and I'm super excited to get an entire list finished. If you've got questions or feedback, I'd love to hear it! You can shoot me an email at loswarmahordes@gmail.com, tweet at me @LoS_Jaden, or comment/message on Facebook.